On Thursday, December 21st, 2017, TED released a talk by MASS’s own Christian Benimana, about his vision for training the next generation of African architects and designers at the African Design Centre. The 13-minute talk, which was recorded at the TEDGlobal 2017 conference in Arusha, Tanzania, highlights the challenges Mr. Benimana faced to become an architect, and his vision to train young African leaders who share his aspirations. 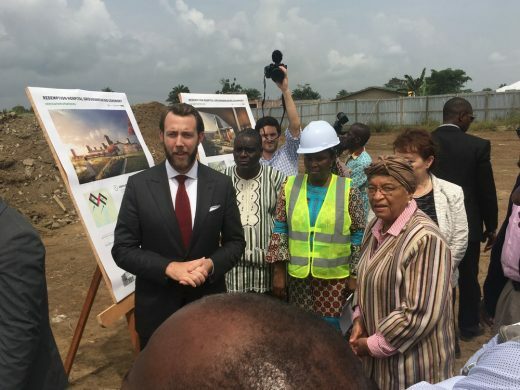 On Tuesday, December 19, 2017, Her Excellency Ellen Johnson Sirleaf, President of Liberia, hosted the groundbreaking ceremony for a new national hospital for Liberia, New Redemption Hospital, located in Caldwell, Montserrado County, just north of the capital city, Monrovia. The ceremony included the participation of Dr. Bernice T. Dahn, Health Minister, Dr. Peter Coleman, Senator of Grand Kru County, Ms. Larisa Leshchenko, Liberia Country Manager for the World Bank, as well as delegations from MASS and the Clinton Health Access Initiative (CHAI). The New Redemption Hospital is to be a state-of-the-art teaching and tertiary care facility with a mission to renew trust in Liberia’s post-Ebola healthcare system. The hospital will have a total of 155 beds with a primary focus on pediatric and maternal care. In January, site work for the future home of the Butaro, Rwanda campus of the University of Global Health Equity began. Construction is well underway and scheduled for completion in 2018. In February, MASS completed a report with Ariadne Labs, a joint center between Brigham and Women’s Hospital and the Harvard T. H Chan School of Public Health, on research and analysis of how design impacts clinical processes, decisions and outcomes during childbirth. The study earned some positive press including from Becker’s Hospital Review and Quartz. In March, MASS completed construction documents for Nyarugenge District Hospital, a 120-bed facility located in the most densely populated district of Rwanda. The hospital will be our first hospital to use our design standards for the Rwanda Ministry of Health in an urban context. In April, MASS Co-founder and Executive Director, Michael Murphy, keynoted day one of the AIA annual conference, A’17, alongside design leaders Liz Diller, Alejandro Aravena, and Francis Kéré. In May, the ADC sponsored a first of its kind symposium gathering top architects, planners, and scholars from all over Africa to discuss the most pressing issues facing our cities. The symposium created a rare opportunity for these leaders to convene in Africa to discuss the severe shortage of skilled designers needed to produce a healthy and sustainable environment. In an effort to be proximate, MASS launched the Hudson Valley Design Lab in Poughkeepsie New York in June. This hybrid office is both a design think-tank and an outreach exhibition gallery that is working to be a local catalyst for changing the perception in our fringe cities and creating regional networks towards projects that aim to empower communities. By July, the staff of One Acre Fund (OAF) had completely moved into phase one of the new Kakamega, Kenya campus. MASS is currently working with OAF on phase two, which is set to start construction in 2018. In September, MASS, with John McAslan + Partners, presented in the final round to the jury of the United Kindom National Memorial to the Holocaust. While the submission was not selected, MASS was pleased to be a finalist with such firms as Zaha Hadid Architects, Foster + Partners, and Adjaye Associates, among others. In September, a groundbreaking ceremony was held in Butaro, Rwanda, for a new block of housing for patients receiving cancer care at the Butaro Ambulatory Cancer Center. In October, MASS was awarded the prestigious Cooper Hewitt Smithsonian Design Museum, National Design Award for Architecture. The Award was given by Vice Chair of the Clinton Foundation, Chelsea Clinton. For the second year in a row, MASS was listed in the top 10 of the design category, in the annual Architect Magazine firm ranking that was released in November. In December, CNN published a piece on maternal health in Malawi that featured MASS’s work on the Maternity Waiting Village in Kasungu. The short film was originally broadcast on CNN networks across the African continent. 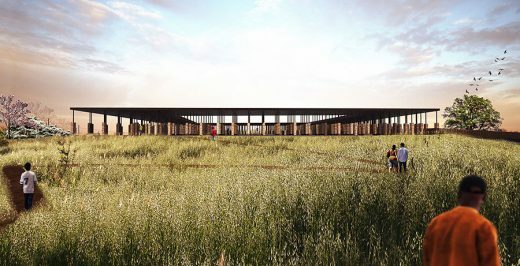 The Equal Justice Initiative (EJI) unveiled plans this week for the Memorial to Peace and Justice in Montgomery, Alabama. Designed in collaboration with Boston-based MASS Design Group, the new memorial is intended to acknowledge victims of lynching throughout American history. The architects studio was brought in by PIH in 2008 to help plan and design a first-rate facility that would help reverse these conditions. In the design of the hospital, MDG and PIH sought to create a more holistic model of architecture that included the design of an appropriate, state of the art hospital while also fully choreographing the process of construction to employ, educate and empower the local community. MASS creates well-built environments using appropriate design, local investment, and innovation to break the cycle of poverty. We collaborate with governments, NGOs, private sector firms, and health care experts to advocate for the most underserved and provide scalable models of community-based development and training. MASS has shown that innovation, driven by interdisciplinary research and immersion in the field, can deliver well-built environments that are efficient, effective, and empowering. By addressing immediate infrastructural needs and simultaneously building systems to address the social determinants of failure, our work constructs agency, serves as an engine for economic growth, and assures long-term sustainability. We build capacity at all levels—from training unskilled laborers to assisting government ministries in writing policies that establish more holistic and appropriate project outcomes. Michael co-founded MASS in 2008 to provide design services for underserved populations in the most resource-constrained environments. In addition to leading the design and construction of the Butaro Hospital in Rwanda, completed in January of 2011, Michael has been the recipient of the 2010 Design Futures Council Emerging Leader Scholarship, and has taught courses on design for infection control and design thinking for business entrepreneurs at Clark University and Harvard University’s School of Public Health. Alan received his Bachelor of Arts from Colorado College and his Masters in Architecture from the Harvard Graduate School of Design. Alan manages the Boston office working on projects including the Butaro Hospital in Rwanda, GHESKIO Tuberculosis Hospital in Haiti, research on infection control and health facility design for the WHO, and policy development for the Liberian Ministry of Health. Alan is an adjunct faculty member at Clark University and has been a guest critic at Colorado College, Harvard, Northeastern, and the University of Texas. December 30, 2017 in Architects.